Having a baby turns one’s life upside down so it is not surprising that sometimes all young parents speak about is their little one. I have to admit that I am more than guilty of this. That said, being a mom is and will not be all my self-definition is about. So why does the world suddenly want to define me first by my pregnancy and now by my baby? I first observed this in the birth preparation class that I was taking and it has haunted me ever since. I felt quite happy about this short intro, particularly as I always get a little nervous when speaking German in front of strangers. But, as the other ladies begun introducing themselves one by one, I started feeling more self conscious with each new speaker. Why? You see, none of them was sharing more personal information about themselves than their name. Everything else was about the pregnancy: the due date, if it is the first or the second, whether they have had any complications, so on and so forth. I have seen this pattern repeat both in the baby class and in my post-pregnancy fitness course. Suddenly nobody is interested in me as a person anymore. It is all about the pregnancy, the birth, and the baby. Yes, of course, these are very important things in my life but they are not the full sum of my life. Am I the only one who finds it strange to be in a room full women and their babies, knowing their names, birth dates, addresses and phone numbers, how much they sleep at night, or how their baby’s digestion is handling solids, but not really knowing anything about their life aside from the baby? The things you would usually share with people you meet – what you do for work or studies, your tastes, likes, or hobbies – have suddenly become secondary. Maybe I really am the odd one out. 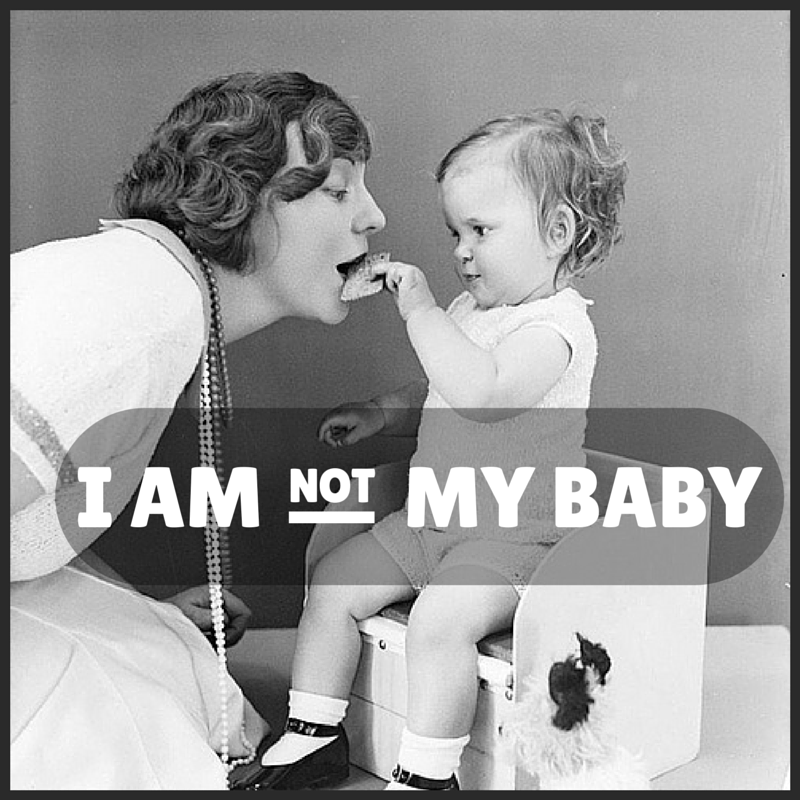 So many moms use and abuse the words “we” and “our” when talking about their babies. We are teething! Our first step! Fast forward a few more years and it is: our first day of school! Ahem, no. You are not going to hear such words coming out of my mouth. We are not teething. Birdy is. We may or may not be sleeping through the night, but that is just because she wakes me up if she is not sleeping. And why would my baby’s achievements to hold her head, roll, or crawl be something “ours”? She did it all by herself, through determination and non-stop practice, I am simply a proud bystander who enthusiastically cheers her on. No, I am definitely not my baby. Hi Ilzele, I feel exactly like you. I often hear mothers talking about their babies as if they were an appendix of their bodies and it feels a bit disturbing. The deep and ever-lasting bond that we have with our children doesn’t justify over-using the plural! Our babies are independent creatures, they live, feel and experience life by their own. It is true that in the first years of their life most of the experiences are mediated by us. Certainly we are an important part of their life and we are there to support them. But ours is a supporting role. Strong, deep and necessary but, still, a support. Thank you for the comment, Virginia! I couldn’t have said it better, there is a fine but important line between being close and supportive of the baby and treating the baby as if it was an extension of yourself. You know what, this rule is valid in other countries and languages too. “WE” I will never understand it.. And the people (in this city) asking questions about “you”. Oh, they never ask, they are not interested (if they don’t want something). I can’t understand how they develop a conversation for a friendship here. Oh no, that sounds really sad. Where do you live?